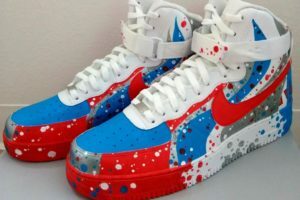 Arden Fair brought together 4 local artists to create one-of-a-kind masterpieces on white high-top Nike Airforce 1s. 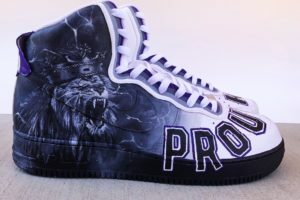 Each artist was responsible for creating a design that aligns with the different Sacramento Kings jerseys and Sacramento as a whole. Our goal with the custom sneakers is to celebrate our city, celebrate our local artists, and to show that we’re all united and Sacramento Proud. 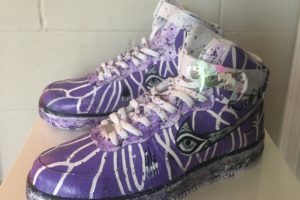 Proceeds from the auction will benefit the Men’s and Women’s Leadership Academy (MWLA), a youth program in the Sacramento City Unified School District. MWLA is SCUSD’s effort to provide low-income students of color supportive learning environments. As a visual artist, Melissa in a constant state of creation, whether through painting, illustration or design. Her work is characterized by clusters of colorful cells juxtaposed with technically lined pencil drawings of people, places and things that intrigue her. She enjoys forcing these visual elements together within her clusters, thus creating a new whole. Ultimately, her work serves as a fragmented record of life on Earth, presenting assorted elements that make it such a fascinating, complex, absurd and cherished place. Melissa is a California native and studied graphic design at the Academy of Art University in San Francisco. Her work has been shown throughout Sacramento as well as in San Francisco, New York City, Paris, Denver, and New Hampshire. portrait paintings that tantalize the eye. the arts at a young age and has been drawing and painting since she was four years old. Her current work focuses on portraits in multiple styles and mediums, varying from oil paints to digital media. She enjoys creating unique self portraits that inspire self confidence, expression, and also incorporate influences from her Filipino background to promote diversity and her pride for her heritage.